Welcome back to day 2 of the 12 Days of Christmas! The weather outside today is cold, snowy & windy...a good day to put on a Christmas CD and spend the day in the kitchen baking Christmas cookies. "The pretty pink color comes from the cherries and cherry liquid; no food coloring is necessary. They taste like chocolate covered cherries....delicious!" Heat oven to 325 degrees F. Beat butter in a mixing bowl with an electric mixer on medium to high speed for 30 seconds. Add powdered sugar and salt; beat till combined. Beat in cherry liquid and almond extract till combined. Beat in flour until thoroughly mixed and them add cherries; mix well. Shape dough into 1" balls and then roll in sugar. Place balls 2" apart on an ungreased cookie sheet. Bake 12 minutes. Remove from oven; press an unwrapped candy kiss on each cookie. Return cookies to oven and bake an additional 2 minutes or until cookies are lightly browned on the bottom. Transfer to wire racks; cool. Makes 48. "These cookies are so easy to make & will receive rave reviews from your family & guests." Preheat oven to 350 degrees F. In large bowl, with mixer at medium speed, beat butter and cream cheese until smooth. Add sugar and vanilla and beat until fluffy. Reduce speed to low; gradually beat in flour until blended. Transfer half of dough to small bowl; stir or knead in enough red food coloring to tint dough a deep red. Form each section of dough into a log about the length of your spritz gun. Now cut each log in half lengthwise. Put a cut red and white log together and gently twist the two sections together in a candy cane fashion and then place into your spritz gun fitted with the star tip or a piping disk. Press dough in 5-inch strips, 1 1/2 inches apart, on ungreased large cookie sheet. 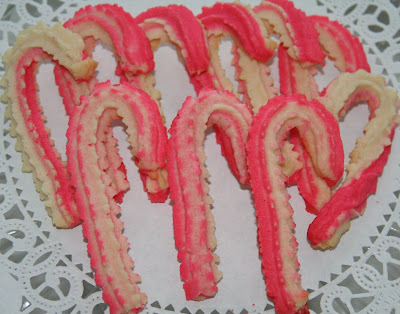 (For "finished" ends, cut off each strip from tip of cookie press with paring knife.) Bend 1 end of each strip to shape into candy cane. "You can ensure cookie baking success by choosing high-quality ingredients and using them correctly. Here are some tips about ingredients." *Use the right fat option. When a recipe calls for butter it is important to use butter. Many margarines contain considerable amounts of water and will yield undesirable cookies. Butter gives cookies wonderful flavor and ensures good results. *If you want to use margarine instead of butter, use only stick margarine that contains at least 80 percent vegetable oil. Margarine will produce a softer dough, requiring a need to chill it longer then directed. Spreadable tub margarines contain more water than oil and should never be used for baking. *There is no need to sift flour when making cookies, just simply stir the flour before measuring. Accurate measuring will ensure good texture of your goodies. Always measure flour in nested type metal or plastic measuring cups. Do not pack the flour, but gently spoon scoop the flour into the measuring cup. Level off the top with a straight edge of a metal spatula. *When making cut out cookies, work with half the dough at a time. Keep the other half refrigerated. Roll dough on a pastry cloth with a stockinette-covered rolling pin. Use powdered sugar rather then flour on your cloth as necessary to prevent sticking. The use of flour can toughen cookies. *Dip the cookie cutter into powdered sugar between cuts to keep dough from sticking to it. *Handle the dough as little as possible. Combine dough scraps into thick "pancakes", and chill before re rolling. *Decorate cookies with colored sugar immediately after rolling and cutting. Once the surface dries a bit the sugar won't stick as well. *Wait until cookies have cooled completely before icing them. "A good reason to simply get together with friends & neighbors for a holiday party." *Pick a date and send, phone or email invitations. *Ask guests to bring one kind of special homemade holiday cookie (no store-bought sweets allowed). Specify the number of cookies each person must bring; three dozen is probably the minimum to ensure that each guest takes home a good sampling. *Suggest that everyone bring extra containers for transporting their cookies home in. *Ask the guests to provide copies of their recipes and share the origins or some other story about the cookie recipe. *The number of cookies guests take home is based on the number they brought. "no bakee, no takee". *Also ask that the guest brings a separate plate of cookies for a tasting buffet. Depending on the time of day, consider serving a salad luncheon or a potluck supper. *Turn your cookie exchange into a fund-raiser for a favorite charity. Ask guest to bring a gift for a sponsored family or local food pantry. *Combine a holiday activity, such as caroling, sledding or ice-skating with a family cookie exchange. Oh my!!!! 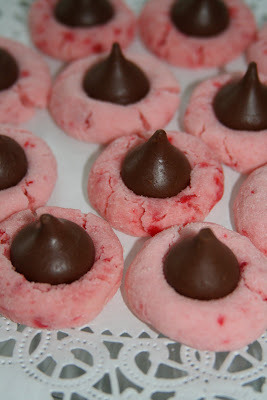 Those cherry chocolate kiss cookies look and sound like heaven! I'm enjoying your 12 Days of Christmas! It was also nice to hear that there is another person that likes to start decorating closer to Christmas! (Rather than the day after Thanksgiving)... Looking forward to Day 3! We make spritz every Christmas, might have to try the candy canes. Yum! Thank you for sharing the recipes! Gotta get some hershey's kisses today to make those....yummy!! !